Createspace Independent Publishing Platform, 9781535185578, 334pp. From the bestselling author of The Spaceship Next Door: "Very occasionally, I will pop up in the historical record. Most of the time I'm not at all easy to spot, because most of the time I'm just a guy who does a thing and then disappears again into the background behind someone-or-other who's busy doing something much more important. But there are a couple of rare occasions when I get a starring role." --Adam the Immortal An oracle has predicted the sojourner's end, which is a problem for Adam insofar as he has never encountered an oracular prediction that didn't come true . . . and he is the sojourner. To survive, he's going to have to figure out what a beautiful ex-government analyst, an eco-terrorist, a rogue FBI agent, and the world's oldest religious cult all want with him, and fast. And all he wanted when he came to Vegas was to forget about a girl. And maybe have a drink or two. "I am probably not the best source when it comes to who invented what. For a long time I thought I invented the wheel." 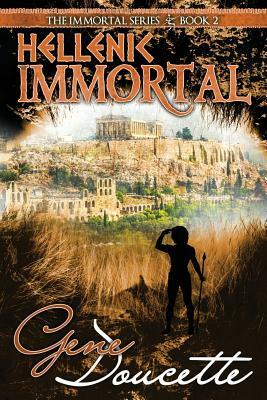 --Adam the Immortal The second book in the Immortal series, Hellenic Immortal follows the continuing adventures of Adam, a sixty-thousand-year-old man with a wry sense of humor, a flair for storytelling, and a knack for staying alive. Hellenic Immortal is a clever blend of history, mythology, sci-fi, fantasy, adventure, mystery and romance. A little something, in other words, for every reader.